There are eight SouveNEAR vending machines inside Kansas City International Airport..
Travelers at Kansas City International Airport might already be familiar with SouveNEAR vending machines. The Kansas-City based company offers handmade items by local artists, such as T-shirts, jewelry, soaps and candy. "SouveNEAR aims to bring locally made souvenirs to busy tourist spots — generally airport, " says co-founder Tiffany King. 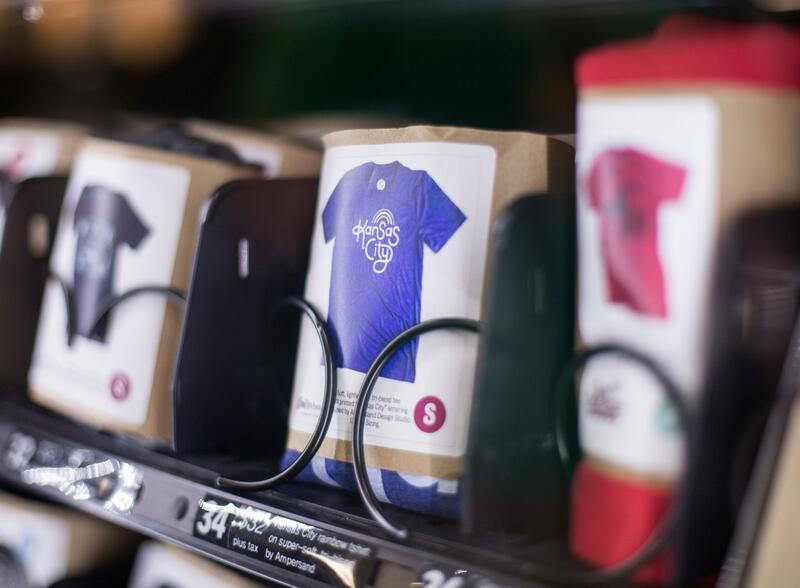 In 2014, SouveNEAR launched at KCI with one repurposed snack machine stocked with the type of locally made goods sold at indie craft fairs or boutiques. Prices range from $2 to $40. The company now supplies 15 machines from coast to coast, at locations in California, Missouri and New Jersey. They're located in a transit center, a hotel and three airports: KCI, Oakland International Airport, and, as of October, Newark Liberty International Airport. King and co-founder Suzanne Southhard hatched the idea after mulling over the experience of traveling and, King says, "not finding the last-minute gifts that we were hoping for and sometimes settling for things that were a little more generic." Each SouveNEAR machine stocks up to 35 items made by local artists. The co-founders, with the help of Kansas City artist Tara Tonsor, head up the curation. Local managers are on the ground in each city, developing relationships with area artists; artists can also submit their work through the SouveNEAR website. The one catch: Their creations have to comfortably fit in, and drop from, the machines. "We definitely have size requirements. We need the items to fit as well as we need them to drop without being damaged in any way," says King. "Size is always a requirement for us, as well as our curation mix." In December, the company plans to expand to an additional Midwestern city. More locations are expected to open in 2019. "Our interest is in helping develop new audiences for them (artists)," says King. "We're looking for kind of the intersection of the need and then also the creative community to support that." Is Every Maker Also A Crafter? If you make your product with a 3-D printer, is it still a craft? On Monday's Central Standard, we sit down with local participants of Kansas City's Maker Faire (coming up June 28 and 29) and a Professor of Art to tinker with our concept of what it means to "craft."